I thought he deserved a place in our rainbow bridge. I have some very sad news. Wally died on Wednesday night of a liver lobe torsion. He was his happy self when I left for work, and when I returned, he could hardly move. I took him to the ER and he died within the hour. My brother wrote me an email that I think captures Wally perfectly. I’ll share a part of it: "Wally’s light was so bright, he was like a shooting star. Shooting stars are brilliant and leave everyone in awe, they just sometimes don’t last long. But their memory lasts forever.” Wally was such a special bunny rabbit with a truly magical spirit. I love him so much and miss him with all my heart. 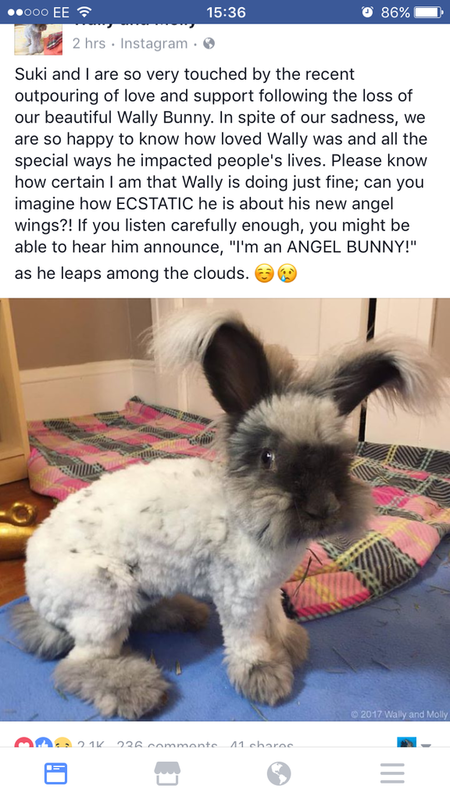 I've never seen/heard of Wally, but it appears he was a bun of character. RIP Wally and have fun at the Bridge. He sounds adorable, binky free little one. Wow he is stunning hunni, I would love a bunny like that. If you don't mind my asking what breed was he please? I thought he was a toy at first. I do follow bunny charities/rescues tho. jolovesbunnies wrote: Wow he is stunning hunni, I would love a bunny like that. If you don't mind my asking what breed was he please? I thought he was a toy at first. Thanks hunni, he is just gorgeous.